Before we get to my packing list, my best suggestion is that you pack light (or at least try to) and I don’t just mean light fabrics! There’s nothing worse than overpacking and lugging around two/three large suitcases while jumping from city to city. John and I had one large suitcase each, but we could’ve easily gotten away with just one between the two of us. 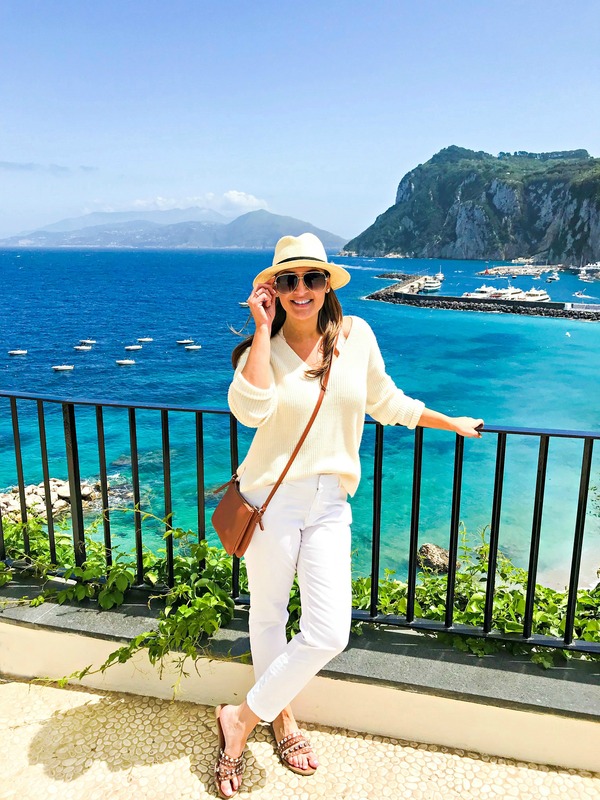 Spring and summer travel is so much easier in my opinion because you can wear less clothes and lighter fabrics so there’s less of chance to overpack. 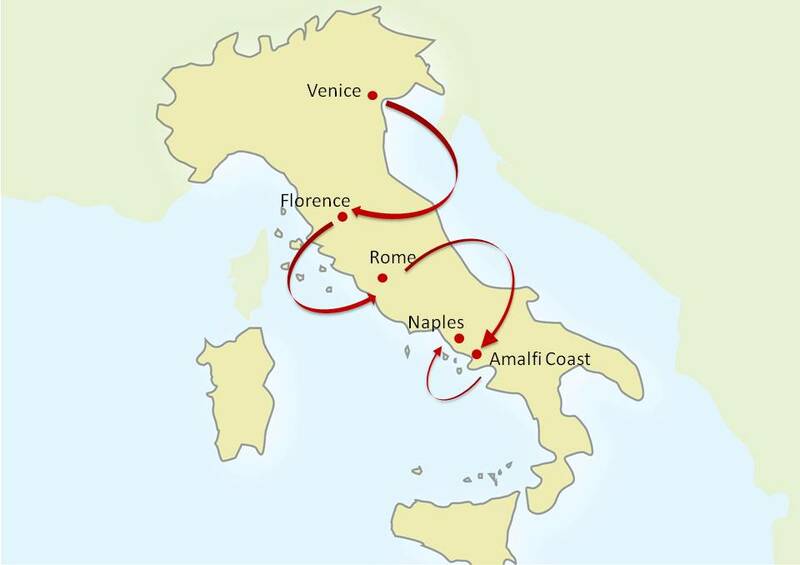 Note: We traveled April 17-May 2 and it happened to be lot warmer than we thought it would be (high 70s and sunny) so be prepared when you’re traveling during Italy’s peak tourist season (June-August). The summer heat can be really uncomfortable so stick with bright and light colors as well as lightweight fabrics (linen, cotton, rayon). Early spring is still cool enough for jeans and a jacket, but you won’t need to pack either for summer. 1. Casual everyday items (e.g. tees, tanks, camis, dressy shorts, capris). 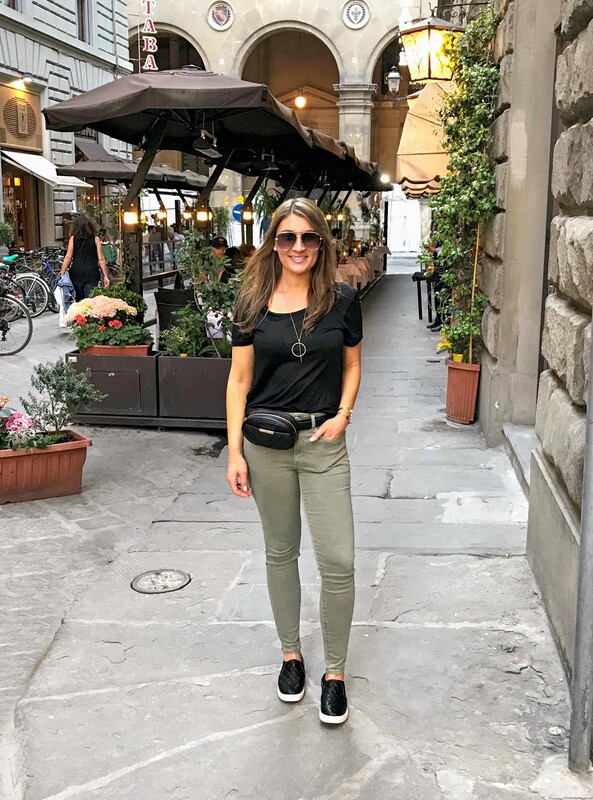 Italy is pretty casual so there’s no need for complicated and elaborate outfits, plus you’re going to be doing a lot of walking and sightseeing so you’ll want to stay cool and comfortable especially when visiting the top tourist attractions (Vatican City, The Colosseum, museums. etc.). Summers in Italy get really crowded and hot (some places don’t have air conditioning) and you’ll be bumping into people, so in this case, less is more. Pro-Tip: Consider packing one pair of bottoms for every 2-3 tops. You can save room in your luggage if you can re-wear some pieces. I’m obsessed with Target’s Univeral Thread and A New Day tees/tanks which are currently on sale for 3 for $20! 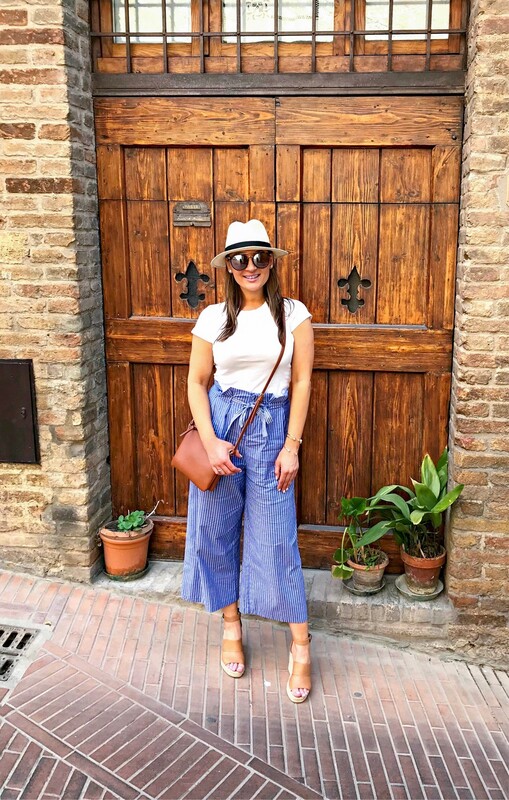 Also, paper bag waist pants and wide leg capris are really popular right now and the ones I wore in Tuscany are on sale for $20! 2. One-piece wonders (e.g. rompers and casual dresses). Shift dresses or tank dresses are my go-to summer essentials. They’re great options for transitioning from day to night because they look super cute with sneakers while walking around during the day and then you can just slip into a pair of dressier sandals at night for a cute and effortless evening look. Pro-Tip: Pack 1-2 outfits max per day. If you’re going to the bigger cities, you’ll be gone for most of the day anyway and you may or may not return to your hotel to change before dinner. It all really depends on your itinerary and your preference. There were some days that we just stayed out from morning to night and there were other days when we were pretty sweaty and sticky so we had to go back to the hotel to freshen up before going back out. Note: When visiting religious sites, you must cover your shoulders and knees so make sure to have a lightweight cardigan or shawl for bare shoulders and stick with capris or mid length dresses. 3. Sneakers, flats, loafers and sandals. Leave your heels and wedges at home! I can’t stress this enough. You’re going to be doing a lot of walking on cobblestone streets as well as up/down cliffs so you want shoes that are comfortable and easy to walk in. Pro-tip: Don’t wear shoes you haven’t broken into. I had purchased a pair of cute fashionable low tops before our trip without wearing them beforehand and they completely dug into my ankle and so I couldn’t wear them the rest of the trip. Also, you don’t want to risk the chance of getting blisters caused by stiff and uncomfortable shoes. That’s a sure way to put a damper on your otherwise amazing vaca. Pro-tip: You might want to save the flip-flops, slides and dress(ier) sandals for the leisurely strolls and beach towns unless they’re cushioned and to avoid getting the bottoms of your feet dirty. Pro-tip: Leave your big designer totes/handbags at home and opt for a crossbody or a fanny pack/belt bag. We didn’t have any issues, but Rome for instance is known for pickpocketers especially at the main tourist sites including the train station so you want to make sure everything is secure. 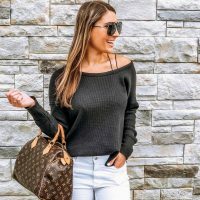 I did carry a large tote to/from the airport and in between cities so opt for one with a zipper to secure your belongings. 5. Accessories/Jewelry (sunglasses and wide brim hats are a must). I mentioned how warm and sunny it was when we went so you definitely want to shield your eyes and cover your head. I love sunglasses so I always pack a few extras to have options for my outfits. Wide brim and panama hats are lightweight which can help keep your head covered from the blazing sun, plus they’re cute and fashionable so it’s a win, win. Pro-Tip: I’d stay away from baseball caps if you don’t want the locals to recognize you as a tourist due to your lack of effort. European style tends to be a little dressier than American style (think dressy tops and dark jeans) so I’d suggest leaving your gym clothes for the gym and your beachwear for the beach. As for jewelry, I stick with the basics (e.g. stud earrings, bracelets, a watch and a couple of necklaces). Pro-tip: Don’t bring any expensive jewelry with you including your engagement ring. As I mentioned above, there are a lot of pickpocketers and if you’re decked out in designer clothes and sparkly bling bling from head to do, you’ll for sure be an easy target. 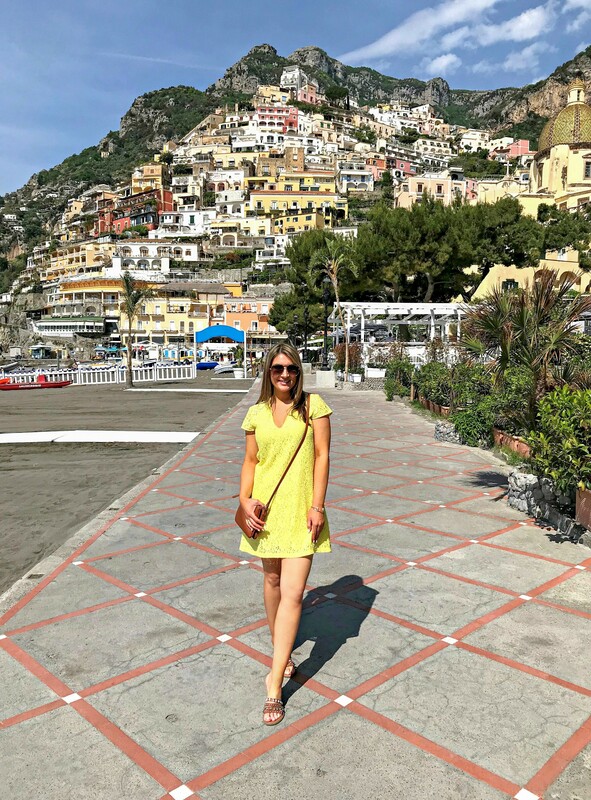 If you’re staying in a villa in the Tuscan countryside or traveling to the Amalfi Coast and other beach towns where you’re able to lounge by the pool and beach all day, you’ll most definitely want to have a few bathing suits and coverups on hand. I always opt for one pieces in bright colors on vacation and I’ve linked a few of my favorites. If you have any questions or if I missed anything, leave me a comment below or email me.